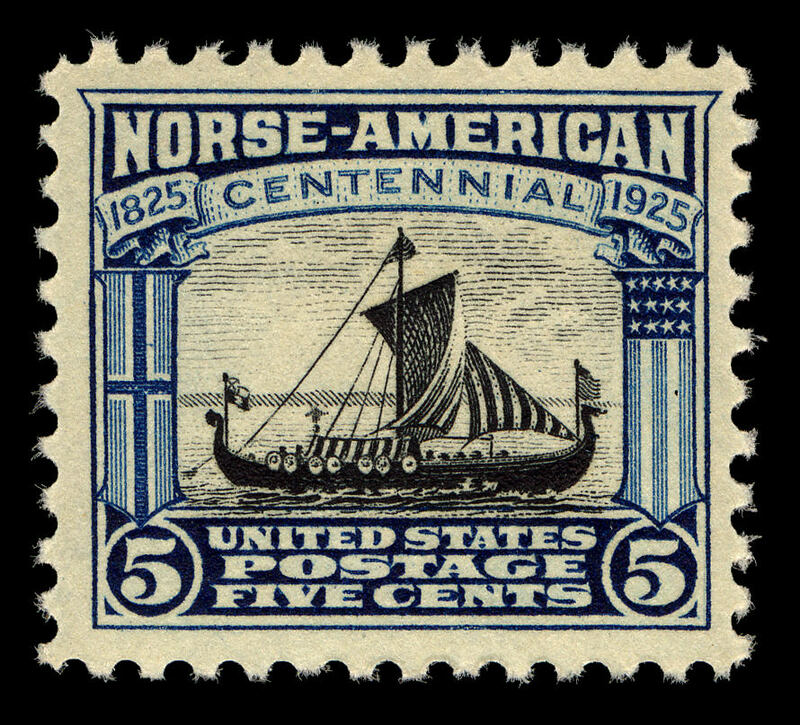 ¶ 4 Leave a comment on paragraph 4 0 The second stamp does not represent the landing but rather, the 5-cent issue featured an engraving of a Viking ship built for the Columbian Exposition. 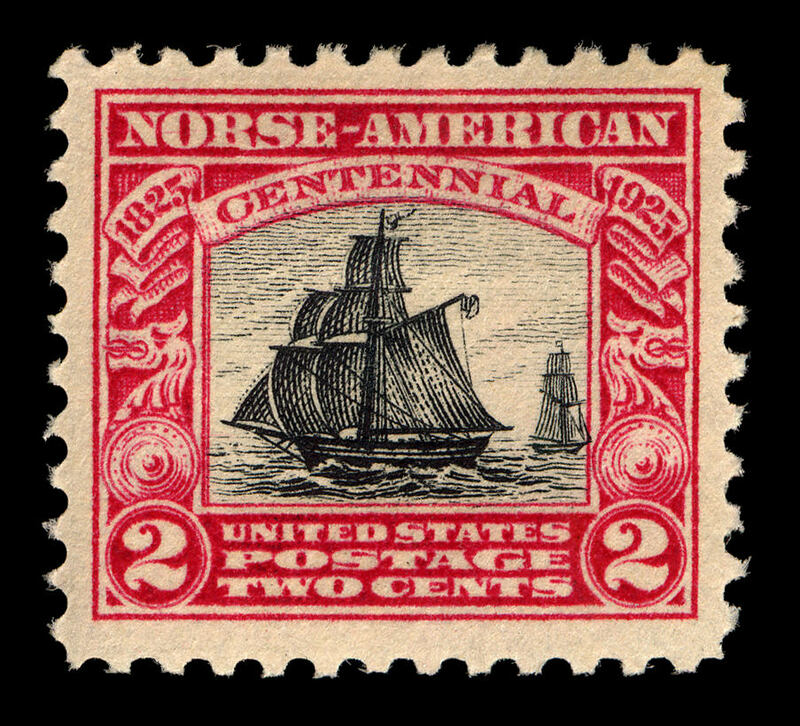 That ship sailed from Norway to Chicago to remind fairgoers and stamp consumers in the 1920s that Norwegian explorers visited America long before Columbus, the English-Dutch Pilgrims, the Huguenots, or the Walloons. This particular image, interestingly, pointed the ship’s bow toward the east, or toward the homeland. 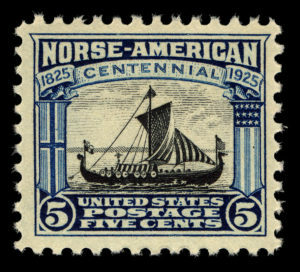 On the stamp, the Viking ship sails from a banner or shield of Norway towards one of the United States and the Norse-American Viking ship is flying colors similar to an American flag. ¶ 6 Leave a comment on paragraph 6 0 These stamps were in high demand from collectors because of the design and intensity of the ink colors. The USPOD received letters requesting the issues be reprinted. 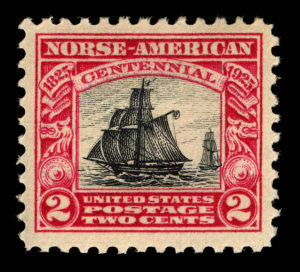 Postal officials regretted that they had to treat all commemoratives consistently and could not reprint this series alone because they would hear protests from other groups claiming the Norwegians received preferential treatment.4) In this case, the USPOD understood that the subject matter represented on the stamp held great meaning for petitioners—past and future—and citizens. Postal officials were careful to balance the sensitivities of commemorative scenes chosen with interests of some collectors who focused more on the particulars of stamps’ designs and artful quality of the production. ¶ 7 Leave a comment on paragraph 7 0 Descendants of these early European settlers wanted to demonstrate that their immigrant ancestors were good immigrant-citizens and worked to transform the U.S. into a great and prosperous nation. Difficult to read in the stamps’ images, these feelings were expressed by the Norwegian-American commemorative committee who wanted to celebrate ethnic pride, but designed the celebrations to focus on messages of good citizenship and patriotism. Even the planning committee and other Norwegian Americans involved with the Centennial felt conflicted over the messages of the celebration. Many Norwegians opposed American involvement in World War I and faced nativistic attacks, not as severe as German-Americans, but strong enough to identify their group as outsiders. By 1925, Norwegian communities in the northern midwest still debated how to balance Americanization and ethnically-constructed heritage activities. 5 Through public commemoration, Norwegian-Americans of the midwest declared that they were nation builders like the pilgrims at Plymouth Rock. And with an episode of their past represented on commemorative stamps, the reach of their story stretched far beyond Minnesota.